What child has not been fascinated by the earth moving equipment on a construction site? 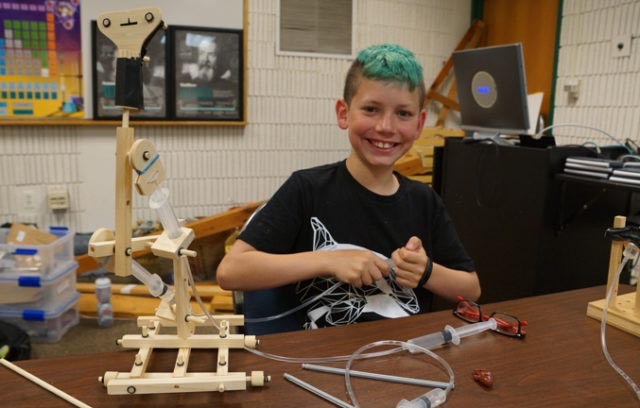 In this program, your child learns about simple machines and how a hydraulic system transmits power to move parts of a machine. We start with an overview on how hydraulics work within simple machines. Children then experiment with the build components in the makerspace to see how they connect and work together. 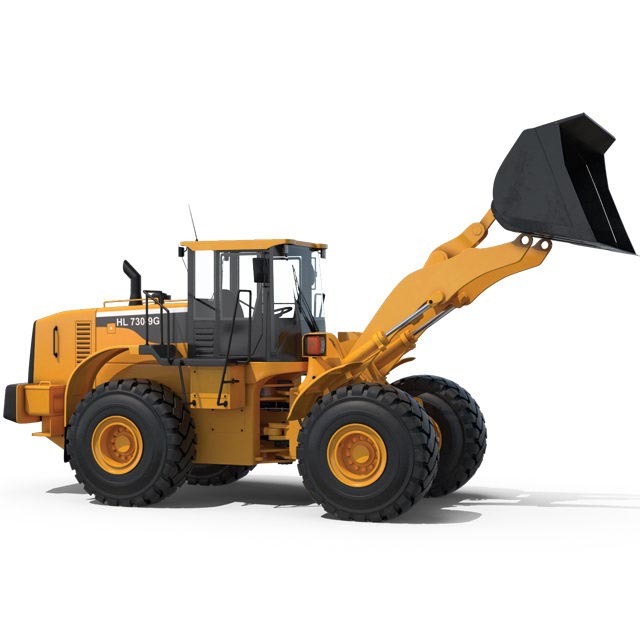 Our corporate sponsor, Caterpillar, provides a custom photo tour of an earth moving machine so your child can see its features close-up, and then model one of its hydraulic systems. We also work with 1:50 scale models of Caterpillar machines for a hands-on perspective on machine design. We explore the design process and consider safety, ethics, selling an idea, cost to build, cost to maintain, and specifications. 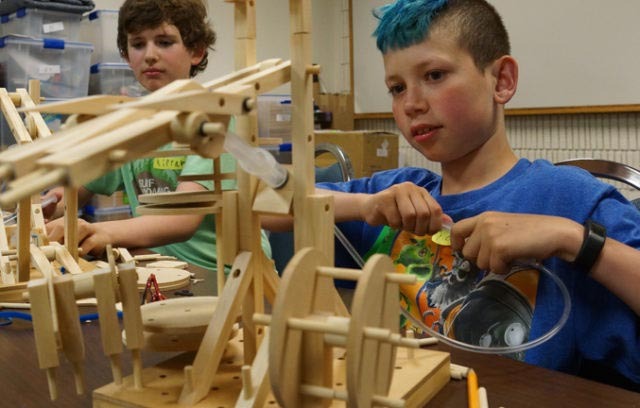 Your child builds one project to take home, and reverse engineers others that are then broken into component parts for other makerspace users to work with. John is the owner & founder of Edge on Science and has a background in civil engineering. It is said that engineers like to take things apart, even if they don’t need fixing. Sooo, for this mechanical engineering STEM program, he has assembled actual hydraulic components and the tools needed to, well you know, fix them! An actual hydraulic cylinder and a pump are provided so that our budding engineers can have a go at taking them apart. Along the way, parts are identified. Close examination reveals how they were made. When the children are done with them, the cylinder and pump are reassembled. Engineers determine the specifications for cylinders and pumps. By taking these apart, your child literally gets hands-on, with those specifications! Why choose the EOS Hydraulics Makerspace? Our scale models of earth movers give context, strengthening your child’s understanding of how a hydraulic system can be used to do work. Children are introduced to the idea of engineering principles, and how they are applied to inventing a machine. Hands-on tinkering is an important part of the process, freeing the imagination and helping to view a problem in different ways. 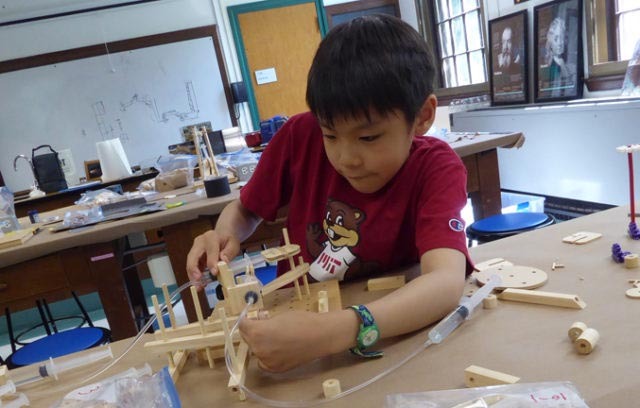 The makerspace components help hone your child’s spatial perception and ability to envision the geometry, the overall form, and the function of the machine they are creating and building. Finally, children are eager to share their STEM creations, simultaneously developing their social and communication skills and reinforcing what they have learned.